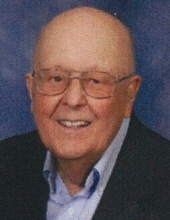 Robert Raymond Sirois, 91, longtime resident of Iowa City, passed away peacefully in his sleep on Friday, November 9, 2018 at Lantern Park Specialty Care, Coralville, Iowa. Visitation will be held Thursday, November 15, 2018 from 4-7 PM at Lensing Funeral & Cremation Service, Iowa City. A rosary will be recited at 3:30 PM and a parish vigil service will follow the visitation at 7 PM. A Mass of Christian Burial will be celebrated at 10 AM, Friday, November 16, 2018 at St. Mary’s Catholic Church, Iowa City. Burial will follow at St. Joseph’s Cemetery, Iowa City. In lieu of flowers, memorials may be directed to The Regina Foundation, 2140 Rochester Avenue, Iowa City, Iowa, 52245. Bob was born on July 6, 1927 in Pittsfield, ME, the son of Ivan and Emma (Franck) Sirois. He served during WWII in the U.S. Navy. Robert attended Maine Central Institute and The University of Maine, then transferred to and graduated from Husson Business College in Bangor, Maine. In 1952 he met his future wife, Jan, at the wedding of his sister Terri to Jan’s brother Don. They fell in love, were married on May 8, 1954 and remained happily married for sixty-two years. In 1958, Bob and Jan moved from Toledo, OH to Iowa City, where they raised their five children. Bob was an accountant for Oral B Laboratories for 32 years, retiring in 1989. He was an active member of St. Mary’s Catholic Church and The Knights of Columbus, where he was a 4th Degree Knight. Bob enjoyed spending time outdoors, especially at his cabin in the Boundary Waters of northern Minnesota. He was an avid fisherman and guide for the family. Bob loved to spend time with his family and tell stories of his childhood and adventures with his friends. Bob is survived by his five children; John (Lori) Sirois of Milwaukee, WI, Mark (Bonnie) Sirois of Des Moines, IA, Lorie (Bill) Graham of Iowa City, IA, Jim (Linda Muller) Sirois of Iowa City, IA, and Bill (Michelle Kattchee) Sirois of Denver, CO; eleven grandchildren, Rachel, Ryann, Josh (Angela), Bryan, Michael, Christopher, Jordan Winter, Kevin, Alec, Marissa, and Michaela Sirois; his sister, Theresa Blaser of Florida; sister-in-law, Betsy Sirois of North Carolina; and his brother-in-law, Father John Blaser of Oregon, OH. Bob was preceded in death by his wife, Janet Sirois; parents; three brothers, Maurice, Richard, and David Sirois; two sisters-in-law, Ada Sirois and Mary Blaser; and two brothers-in-law, Donald Blaser and Eugene “Bus” Blaser. To send flowers or a remembrance gift to the family of Robert Raymond Sirois, please visit our Tribute Store. "Email Address" would like to share the life celebration of Robert Raymond Sirois. Click on the "link" to go to share a favorite memory or leave a condolence message for the family.